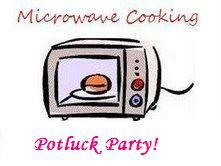 Microwave Easy Cooking event 4th Anniversary with Potluck Party! Here I am with another anniversary celebration of my most favorite event, Microwave Easy Cooking Event! As I have said already I am a sucker for traditions, so I am not going to be different this time. For this anniversary too, it’s going to be a Potluck Party! For the Potluck party, you are welcome to bring in whatever you like and we can all have one big virtual party. So all of August, plan whatever you want to cook in Microwave! You may use food processor to blend or do other things, but cooking has to be done in Microwave! Send in as many ever you want, by 31st August, 2011, with Subject line MEC: Potluck Party 2011! Check out the Microwave Cooking Event Announcement for more details. Please ensure to give clear instructions as cooking in microwave needs specific notes. Linking back to this post is a must and you can add on the logo too if you wish. Entries sent to this event can be sent to other events. It can be Veg or Non Veg. Celebrating with Celebration of Dosas! Microwave Easy Cooking Potluck Party 2009 ~ Next Edition! Happy blog anniversary… Nice party. Congrats Srivalli on completing 4 years of this event….will definitely bring my dishes to the potluck! Congrats for completing 4th year of the event. I'll try to send my entry for the event. will try something to send..
Congrats Srivalli.Count me in. I am definitely bringing something for the potluck party….